Domain aliases enable you to point one or more domains to your primary domain. For example, if your primary domain is example.com, you could have domain aliases for example.org and example.net that point to example.com. 3. Click Add Domain Alias. The Add a Domain Alias page appears. 4. In the Domain alias name text box, type the name of the domain alias. 5. In the for the domain list box, select the domain (the primary domain) for which you are creating the alias. To synchronize DNS between the primary domain and the domain alias, select the Synchronize DNS zone with the primary domain check box. To enable e-mail for the domain alias, select the Mail service check box. 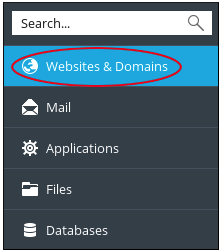 To enable web content for the domain alias, select the Web service check box. To redirect the domain alias using the HTTP 301 (Moved Permanently) status code, select the Redirect with the HTTP 301 code check box. 7. Click OK. Plesk creates the domain alias.